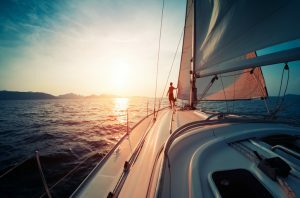 If you’ve been dreaming about sailing to the best destinations in the world, you have probably spent a couple of hours looking at boats that may be ready for the blue water. The assumption in this piece is that you already have a water vessel that is capable of undertaking this adventure. The next thing is to ensure that you have everything ready for sailing hundreds of miles offshore. The best place to start is from the top – that is your mast. The rig is a critical aspect of your boat since you cannot do without it. Do a complete survey of how well the rigging is working before you depart. Anything that looks old or is weak should be replaced – this includes sheaves, sheets, halyards, shrouds, and turnbuckles. The next places to inspect are the deck and down below. Is the deck ready for voyage? Wondering what’s it like to sail a Tall Ship? Well, one of the things you should survey before taking on this enormous adventure is surveying your deck gear. This includes stanchions, sheaves, lifelines, and winches. Make sure that you have a few lightweight spare winch handles. The jack lines should be rigged between the bow and stern pulpits, and they should be easily adjustable but relatively taut. The lifeline entry point shackles should be taped shut to prevent accidental opening by flailing sheets; while you’re at it, tape everything. The companionway is one of the most dangerous places offshore since this is where seasick and unharnessed crew members lounge. Ensure you have a padeye near it so your team can attach tethers to it as they step onto the deck. The companionway should also have good handholds that anybody can grab onto. The floor should also feature a non-skid surface. Down below, the crew feels safer than being up on the deck, and many sailors have found out that this can also be a treacherous place. Ensure that there are handholds within grasp at every point below deck and that everything can be stowed away securely. Batteries and floorboards should be safely secured in case your boat broaches, and you will have access to the vessel’s fittings. The accessories should fit well on recess spaces that are easy to reach in case of failure that may see water enter the hull. For easy access, have a chart indicating where all the hull fittings are located posted (on laminated paper) on areas where everyone can see. Also make a map of where emergency supplies, food, and gear are located. In case of emergencies, you want easy and fast access to safety equipment. If hiring a boat from a particular sailing location, make sure you check out http://avionero.com/, which will pick the perfect flight to your destination, depending on your requirements.